Martha and Mary are the Yin and Yang of the female personality. Martha is the busy worker and house-keeper, active and productive; her sister Mary is reflective, eager to learn. Martha takes the initiative by fetching Jesus to their house when Lazarus dies; Mary sits and listens to Jesus as he teaches. 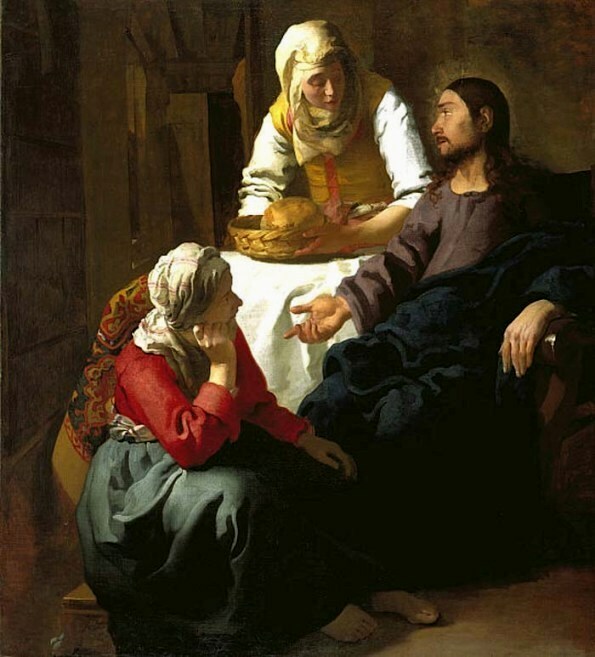 Martha is voicing her grievance to Jesus, but the atmosphere does not seem to be strained. The reverse, in fact. 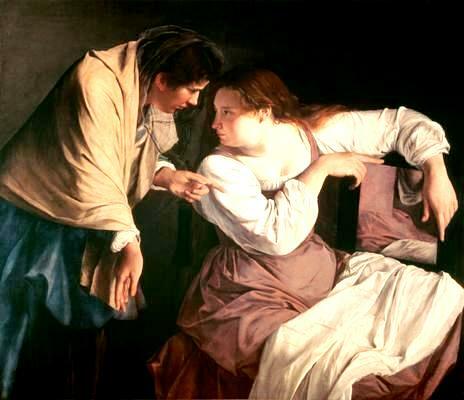 This is a quiet family discussion at its best, with each person respectfully expressing what they feel..
Notice the body language in this painting by Gentileschi. Martha is conciliatory with her right hand but assertive with her left; she leans forward to show that this is a matter of some urgency; she really needs help in the kitchen. Mary is seemingly relaxed, but her face and right hand leave no doubt about what she intends to do, or about who is at the end of that pointing right hand. Martha sits beside a most un-Jewish fireplace, plucking a plump fowl. She has two assistants, but her expressions suggests she is dispirited, and overwhelmed by the amount of work she is expected to do. Mary, meanwhile, sits gracefully in another room, listening to Jesus. Who wouldn’t be fed up with this situation? 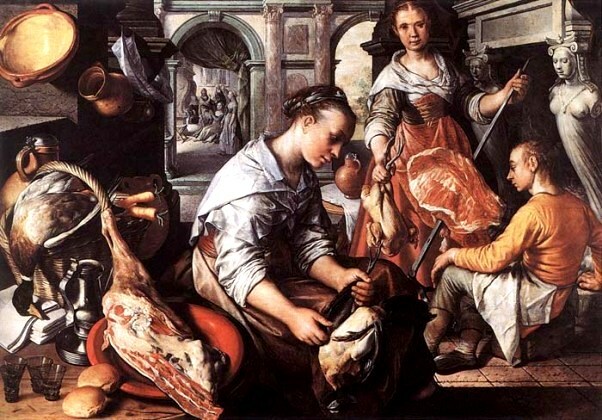 Beuckelaer specialized in market and kitchen scenes, celebrating the bounty of Nature. His pictures were said to contrast worldly and spiritual values, and warn of the pleasures of the flesh, but isn’t there a certain ambiguity in this painting. Where, for example, do the artist’s sympathies lie? With the overburdened workers (Martha’s expression says it all) or with the several women listening to Jesus? Martha is in the kitchen, her own personal kingdom. 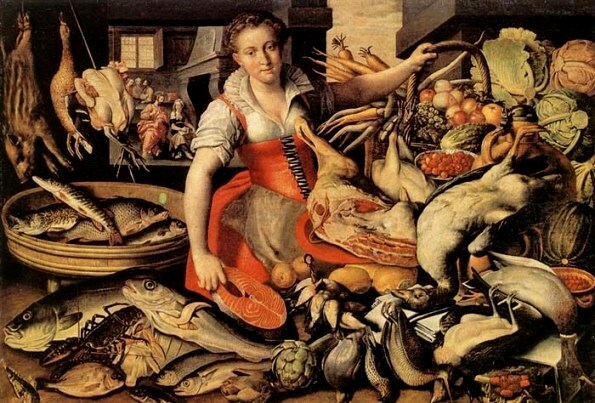 She is strong and able, which is just as well since the quantity of food suggests she will have her work cut out for her, preparing a meal for Jesus and his retinue of disciples. In the background sits Mary, listening to Jesus. 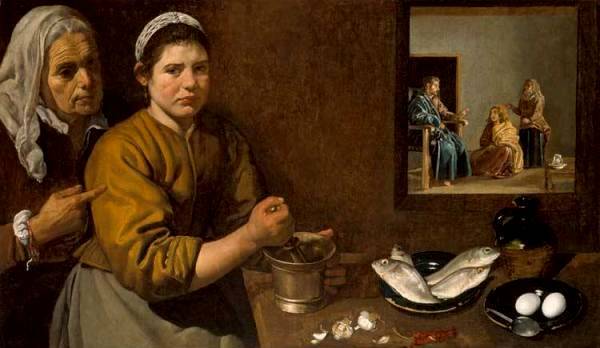 Martha has left a well-stocked 16th century kitchen (in the background), and is now remonstrating with her sister Mary. They have a lot of guests – can’t Mary come and help with the food? Mary seems hardly to hear her sister, so focused is she on the face and words of Jesus. Her luminous face becomes the heart of this painting. Jesus and Mary of Bethany have been talking. Now Martha leaves the kitchen in the right rear of the painting and comes to remonstrate with her sister. 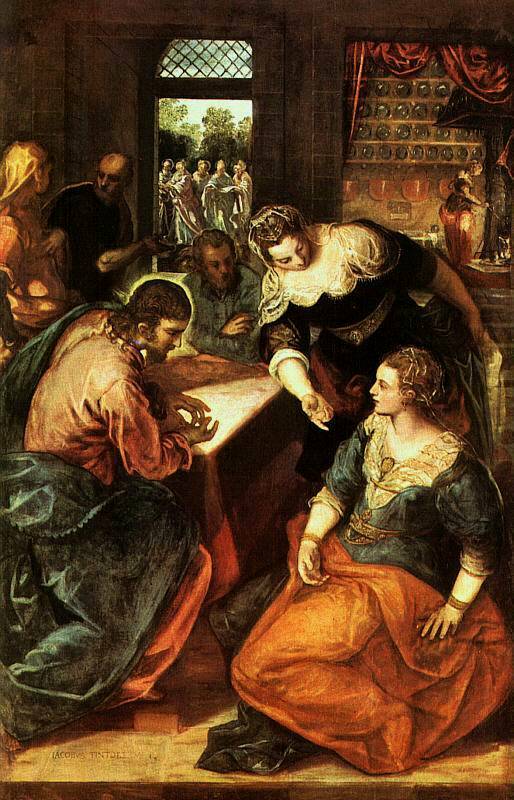 Jesus turns to listen to her, but his posture shows that he is still preoccupied with the conversation he has been having with Mary. 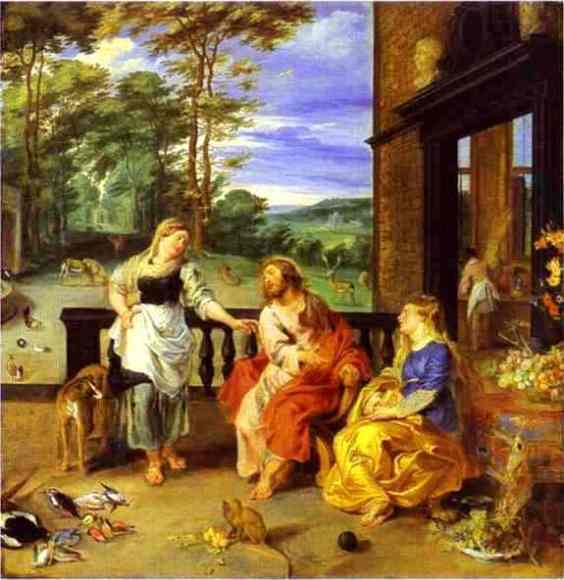 What is a monkey doing (see foreground of painting) in this biblical scene? Introducing a note of whimsy? Some people can make anything salacious and Cagnacci was one of these – as is only too apparent in this painting of Martha and Mary. 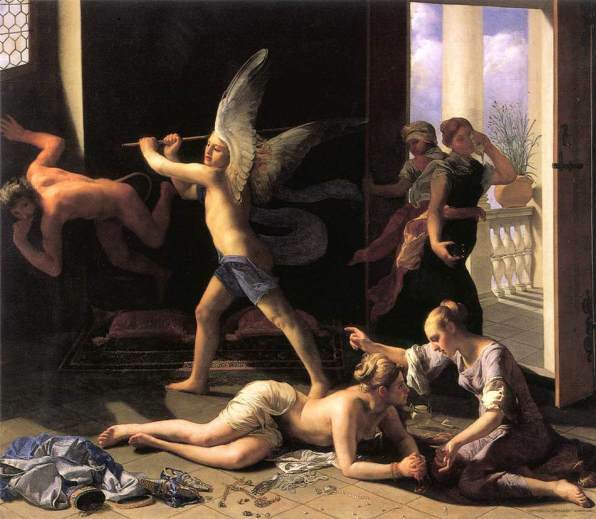 There is no mention anywhere in the authentic gospel story of Martha rebuking her sister for being vain, but since Cagnacci specialized in painting female nudes, he dreamt up one such scenario. Magnificent as the painting is, it has more to do with the fantasies of a young artist who is said to have enjoyed cross dressing, and who did not spend enough time checking his characters’ background story. Bible reference: None that I know of. This painting is a puzzle. What does it depict? 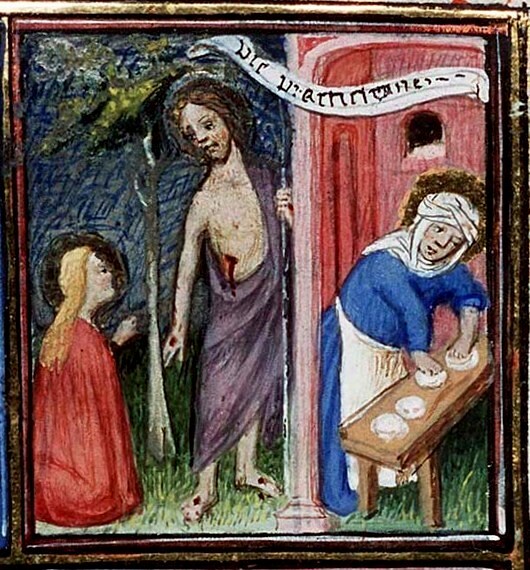 The first incident at Bethany, where Martha complains that Mary is not helping her? The second incident, where Jesus raises Lazarus from the dead? It cannot be this, because Lazarus was raised before Jesus actually got to the house. Nor can it be the third incident, which is set at night inside the house. 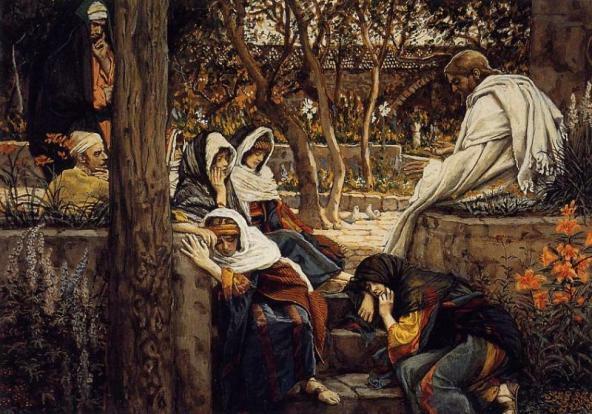 Everyone in the painting seems to be grieving, so it can’t be just an ordinary visit that Jesus made to the house at Bethany. Any ideas?